Boston's Hallelujah the Hills new record turns on dark tones and scuffed textures, but rarely does an album so challenging and deeply layered also deliver immediate impact. We last heard from Boston's Hallelujah the Hills on 2014's Have You Ever Done Something Evil? an album a mix of deep hooks, clever lyrical turns, and gut-punch feeling. With their follow-up, A Band Is Something to Figure Out, out April 12 on the band's Discrete Pageantry label, Hallelujah the Hills' don't replicate that success, but rather they open up a new set of challenges. The darker textures and scuffed-up edges of this record make it seem leaner than its predecessor, but these songs are thick with layers. "What Do the People Want" opens the record on a careful, epic build, only for the record to left turn into the shout-and-rumble of "We Have the Perimeter Surrounded". "The Mountain That Wanted More" and "Spin Them Atoms" are feel like sweet, familiar power pop at first, but they kick up new kinds of dust, clouded in complex layers and tricky melodies. The second half of the record shows the band taking new chances with tone and pace, stretching out "Hassle Magnet" on a bed of heavily buzzing chords, while "New Phone Who Dis" lets just about every notes echo out into seemingly endless negative space to brilliant effect. Through the record, Ryan Walsh's lyrics challenge the listener as much as the music does, but like the music he always lures you in with a carefully placed detail ("They're telling jokes in the ossuary / but the laughs are weak and gaunt") and a killer chorus. 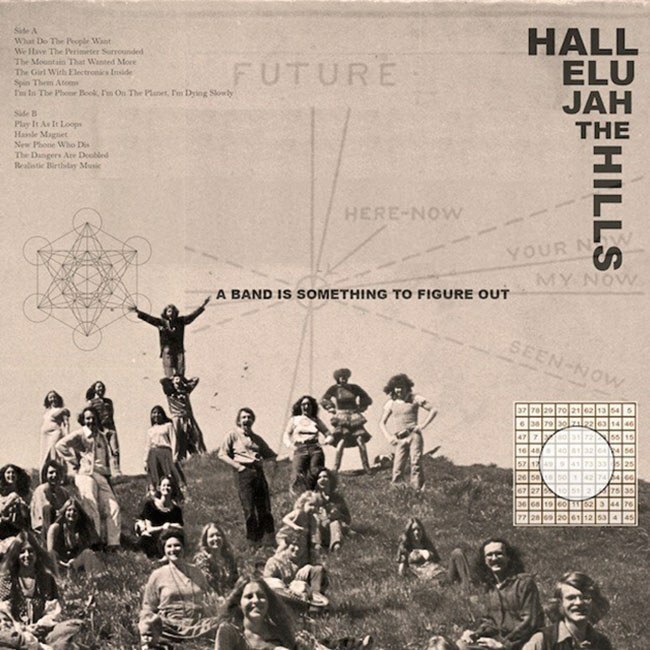 This is, in short, another great record from Hallelujah the Hills, but not better or worse than any other. To compare the band's new work with the old is to miss the point. Just check the title of the new record. The band is constantly figuring itself out anew, and this record has an infectious sense of discovery about it as a result. If the band is shifting, this album asks the listener to take a new angle as well, and taking that challenge on yields big rewards. So start here, with this exclusive premiere of A Band Is Something to Figure Out. The album is out April 12, available in digital and CD formats from Hallelujah the Hills or on vinyl from Re-Vinyl.